If you put MechWarrior and Smash TV in a blender and poured the resulting slurry into your browser of choice, you'd end up with RoboKill, a simple yet ridiculously addictive Flash title from New Zealand-based Rock Solid Games. The premise is standard sci-fi fare: Robots have gone haywire in the space station Titan Prime, and it's up to you (and your decidedly robot-like mechanized infantry suit) to liberate the vessel from their steely clutches. You begin the game with only a pair of light blasters to rain death and destruction on your robot adversaries, but collecting cash and item drops from defeated bots lets you power up your suit's offensive and defensive capabilities. The entire game follows this simple "shoot & loot" formula, but miraculously, it never gets old. 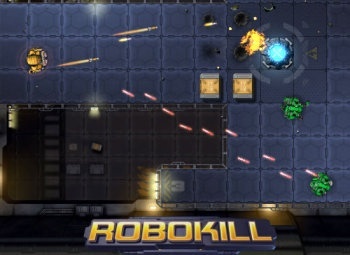 There's a small catch, however: Only the first of RoboKill's three episodes is free to play. To unlock the rest of the game, you have to pay $10 - a steep price for a Flash game, but one that you might actually consider paying after plowing through the first hour of gameplay. For my part, I replayed the final mission of Episode 1 a half-dozen times, hitting the trial version's level cap and decking out my rig with a pair of top-shelf laser cannons before I finally bit the bullet and registered for the full version. When you're through with RoboKill, check out a few of the other titles available from the Rock Solid Arcade. The Dogfight games are a throwback to my days playing Sopwith on my family's IBM PC, while Stunt Pilot ditches the guns and adds a few dozen challenging obstacle courses for you to tackle. They might not have the personality of other, less commercial titles, but when a Flash game is this polished, it's easy to justify spending your lunch break - or your Sunday afternoon - plugging away at it.